Hailed as the ‘Songbird’ and ‘Golden Voice of Africa,’ Malian singer Salif Keita has been sharing his art with the world for 50 years—performing with the likes of Wayne Shorter, Joe Zawinul, Vernon Reid, and Esperanza Spalding. His journey, however, has not been easy. Born with albinism, Keita was banished from his village at an early age due to superstitions surrounding his skin color. Finding kindred spirits among the griots, he quickly rose to prominence as a musician, but was forced to flee the country during the civil unrest of the 1970s and eventually settled in Paris. 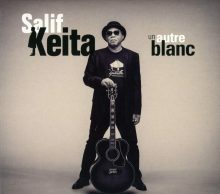 Now, Salif Keita concludes his illustrious recording career with his 14th studio album, Un Autre Blanc (Another White). With Un Autre Blanc, Salif Keita offers a pan-African project with a contemporary flare that speaks to social justice and elevates awareness of the persecution of Africans with albinism. He has gifted fans with ten memorable tracks that are sure to elevate their spirits, while crying out for a world where all are accepted. This entry was posted in World Music and tagged Believe, Brenda Nelson-Strauss, CD review, Naïve, Salif Keita, Un Autre Blanc, World Music by aaamc. Bookmark the permalink.